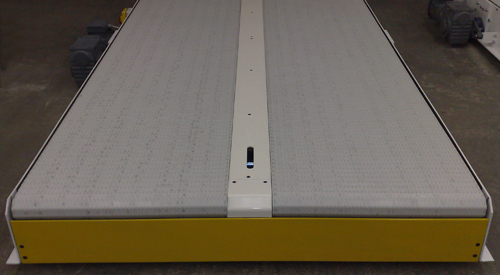 IMS heavy duty plastic modular belt conveyor. Plastic Belt Conveyor is an alternative to conventional roller conveyor and is used in situations where stability of narrow loads and/or operator safety is a concern. 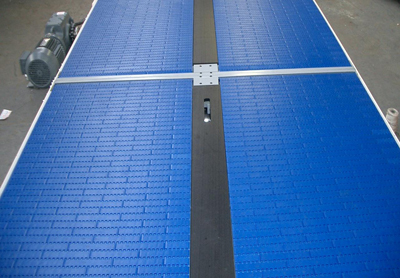 With inverter controlled heavy duty flat top plastic chain the conveyor ensures very smooth movement of loads is achieved. Typical applications are discharge conveyors from Corrugator Downstackers, Board Storage lines and finished goods systems. This conveyor style significantly decreases stack distortion which sometimes occurs when conveying narrow stacks over roller conveyor. Heavy Duty flat top plastic chain conveyor for very smooth conveying of narrow or unstable stacks. No deterioration of stack quality on the conveyor. Safe for operators who must cross the conveyor. Electrical components mounted under the conveyor. Section lengths & widths variable to suit application. Inverter controlled drive motor to each section.